Today we are releasing the new Cacidi LiveMerge with a couple of new tricks in the sleeve. Position of the dragged design to the page is the most critical in the production and many users are using the “place and then adjust method”. With the new possibility to snap a dropped object to a Extreme grid, makes position much faster. The navigation support for subfolder is a great new way of structuring your snippets. And the ability to drag and drop, not just elements that needs to be merged into,but also standard images, make the finishing of you job much easier. The default way of placing a snippet on the page is by dragging and dropping the design to the page, data is being merge into the design, images is places and the design is positioned at the center of the mouse. If you have both the Extreme and the LiveMerge product installed you can now have the ability to change the position of the drop, from the mouse point to the grid setup of Extreme. The dropped snippet (or image) will snap to the grid that is set in the Extreme palette. Just release your mouse within the tile of the grid and the snippet will snap to the position of the tile. You can change from “Snap to Mouse Position” to “Snap to Extreme Grid” in the palette fly-out menu. Folders are great for structuring your work, they give you the ability to see only a limited number of snippets in one “view”. 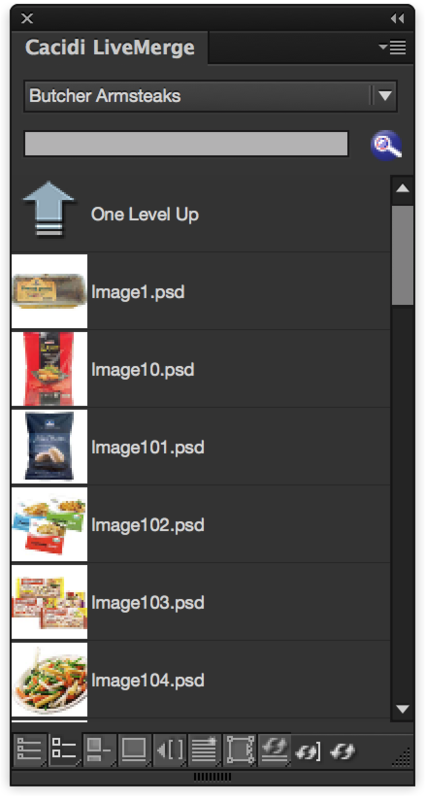 A sub folder will have a folder icon, and once you have entered a sup folder a “Up One Level” icon will appears in the top of the panel. To turn on the navigation you will have to go into a sub folder. 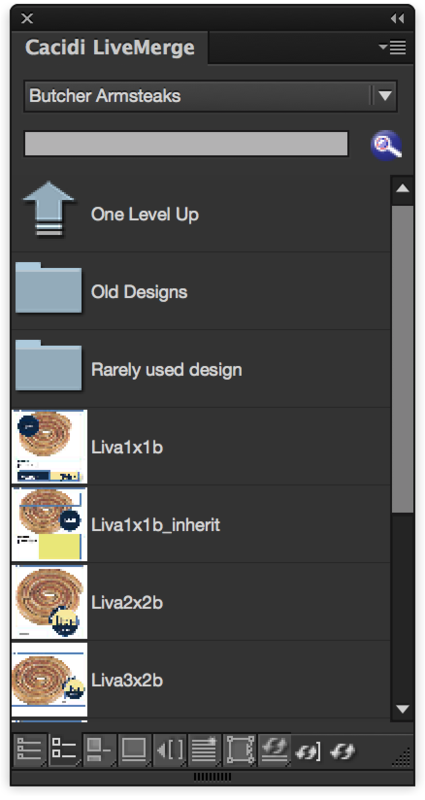 Images you can place are now included in the visual list box panel of LiveMerge, and you can drag and drop them to the page. The Image drag also are able to use the mouse point or the Extreme grid snap function. The size of the image is determined by the grid in Extreme, if you donate have the Extreme installed, a 3×3 grid is the default size of the dragged image. The position numbers shown in the insert merge field of list record view are still there but when showing with reversed Record/Designs (Designs shown in the popup menu), the numbers are now gone for better clarity. A bug is fixet for a double cache when updating from a not text files. Significant improvement has been shown. Hello Richard, is there an updater or should we download and re-install ?